In the not so distant future, a global war that was started because of religious division has left the world on the verge of annihilation. With no hope in sight, 16 men and 16 women leave Earth to form a new society free of war and religion. Society is restored on the planet Sardis; for 25 years the people from Earth raise their children without the concept of God or religion. The purpose of life, the children are taught, is to reproduce and build a better society for their own children. There is peace on Sardis until peace is disturbed when Eagen, an ambitious teen, discovers a Bible hidden with some of the remaining belongings from Earth. 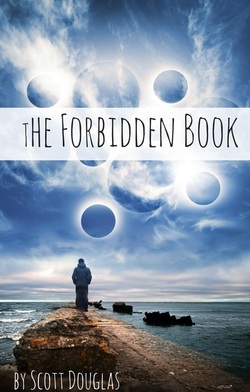 The Forbidden Book is a social commentary that mixes religion and mythology into a story about what faith can do to a society, and questions whether man ultimately needs hope in things greater than himself to survive. In the end, men who wanted world peace destroyed the Earth. Armies, in desperate attempts to end the fighting and claim victory for their cause, fired weapons into the skies and onto cities, unleashing blackness on the entire world. In this man-made apocalyptic world, there was no day and there was no night. Peace efforts had failed. All the nations had drunk the maddening wine of peace’s adulteries. New York, London, and Tokyo all fell simultaneously by the impact of the same super bomb that would ultimately destroy the entire world. In the ruins of cities, deformed bodies tortured by the radiation that choked their insides, cried in pain as they begged for death. Fires burned in lakes, there was thunder but no rain, and animals had become mutilated beasts. By the same company that had created the computer chip that went in the guided bombs that had destroyed these three cities came the funding and technology for the mission that would bring forth a new civilization—free of wars and the root of all other evil. In the last days of Earth, sixteen men and sixteen women were chosen to begin a new life on a new planet, and create the society that would save the human race from destruction. All of the chosen were married—chosen for their physical fitness, intelligence, fertility, and belief in the same ideologies. Their mission would launch their shuttle and their lives out of the darkness of the Earth, and into a distant planet identified by remote satellites as comparable in resources and habitability as the Earth had once been. In the spacecraft, were the detailed plans for the new society—the manuals for survival, seeds for vegetation, necessary tools, and the laws for a new government. As the crew prepared for the launch, some of the couples held hands; some gazed ceaselessly into the dome ceiling that would open and reveal the flight path of their new destiny; and some closed their eyes and quietly mediated. All anxiously waited for a better day. Those outside the ship quietly hoped for the mission’s success and despaired over their own unfortunate future. When the countdown began, in that instance, all was quiet and free of war. A red glow filled the horizon as the bay doors opened and made a clear path for the shuttle from its position in the launch silo. A rare glimpse of the rising sun could be seen. Slowly, powerfully, the shuttle began to rattle and hum as it thrust upward off the ground and into space. Through the window of the shuttle, the war below could be seen. Tanks and troops were approaching each other preparing to engage in battle. A S.A.M. missile came within one hundred feet of the shuttle’s wing, but the nerves of everyone inside made most of them miss the dramatic action. When all hope was lost and the Earth faded, the shuttle lifted out of the Earth’s atmosphere. The dark vastness of outer space in all its galactic infinite seemed brighter than the world they left. And as the spacecraft turned, all the eyes of the crew inside it glimpsed their final view of Earth. It was nothing but a large, cloudy haze—a disproportioned dark ball, which at one time had been lush and brilliant. ---Proclamation to the future inhabitants of Sardis entitled “Let Us Never Forget” written by Razi, Chief Judge, in the first year of man’s reign on Sardis.